Sirenia, the brainchild of ex-Tristania composer and musician Morten Veland, seems to keep searching for a solid musical foundation, but never quite arrives nor breaks new ground. This is most likely due the female lead vocal position being a revolving door. Sirenia is on no less than their fourth lead singer in as many releases. The latest is Ailyn (Pilar Gim�nez Garc�a), a member of the Spanish version of Britain's X Factor which, I guess, is like American Idol (this wouldn't be my first place to look for talent). With Ailyn in tow, Sirenia delivers another disc of gothic/symphonic melodic metal for the masses on 'The 13th Floor.' Yet, as you well know, it takes a bit more than the standard fare to shake up this venerable and bloated genre. On 'The 13th Floor,' Sirenia does only a little to help itself and the genre gain ground. Most of the advancements come in the form of more complex compositions which near progressive diversity. Three songs stand out in particular because of this: 'The Seventh Summer,' 'The Lucid Door' and 'Sirens Of The Seven Seas.' Though often symphonic and bombastic as expected, Sirenia mixes it up by shifting musical moods and styles on each song. However, as good as these songs are, they are practically devoured from the inside out by the very thing that nearly erases the musical advancements of the work. Sirenia has seen fit to ratchet up the use of dirty and death vocals throughout 'The 13th Floor.' Their inclusion only makes you feel that, once again, another band has succumbed to current trends in order to increase commercial viability. It's not like this hasn't been done before. To coin a phrase: you can put an old fish in fresh newspaper, but it's still going to stink. Sirenia's 'The 13th Floor' succeeds when they push the normal goth/symphonic metal to more progressive ends which occurs only on three songs. Otherwise, the only other new thing here is the increased use of dirty/death vocals. But this only results in Sirenia falling backwards and succumbing to current mediocre trends. Though admirable, 'The 13th Floor' could have been better if Sirenia would have pursued their progressive instincts more fervently. 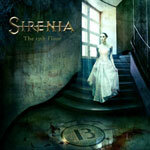 'The 13th Floor' succeeds when Sirenia pushes towards more progressive ends which occurs only on three songs. Otherwise, the only other new thing here is the increased use of dirty/death vocals. But this only results in Sirenia falling backwards and succumbing to current mediocre trends. Though admirable, 'The 13th Floor' could have been better if Sirenia would have pursued their progressive instincts more fervently.